In 1968 Lyndon Johnson had what was called a “credibility gap” with the American people. He had consistently lied to us about Vietnam, and we didn’t believe anything he said. As the incumbent President, he could have had the Democratic nomination if he’d decided to fight for it. But as a career politician he was smart enough to see what awaited him in November. So he pulled out, and walked away from the only job he’d ever lusted for in his life. He didn’t want to suffer the humiliation of defeat. On With All Due Respect Donnie Deutsch said he’s come back around to a hunch he’d had before. He knows Trump and his family personally, and thinks he could drop out in order to avoid having a big “L” tattooed on his forehead. It’s pure speculation, but as Ivanka and the rest of the family watched him today, they may see this as his best move. For himself, his brand, his family and his country. I thought it was a terrible speech, awkwardly delivered. He doesn’t do teleprompters well. To do them well, you have to practice. I doubt Trump practices at anything, including golf. So it will be back to doing improv at the rallies, and dishing out the red meat his fans love. The polls won’t be turned around by rallies and fiery rhetoric. If he’s worse off than he is today, he’s got to give pulling out by Labor Day some thought. He could compare himself to the running back who leads his team down to the one yard line, only to see the quarterback sneak in with the winning touchdown. It isn’t right or fair that the QB gets the glory. It’s just a smart call. And everybody knows who really won the game. Pence should be the one that takes the reins. He can truthfully say that Trump has changed the direction of the Republican Party as much as Barry Goldwater did. He took it away from the elites, just like Barry did, and gave it back to the people. He won those primaries because voters were sick of Bush Republicanism, and he was its antithesis. Pence can be just as hard line on the issues as Trump was, and he wouldn’t skip a beat. Secure the border, and pursue pro-American immigration, refugee, trade, and foreign policy. In a word, nationalism. The GOP of my youth was nationalistic as hell. That’s why it appealed to me. But the Bushes are globalists, and their influence in the party was destroyed by Donald Trump, and for that every Republican owes him a debt of gratitude. The globalists, the George Soros’s and the Davos crowd, they’re the enemy. Trump has dealt them a mighty blow. But if he stays in and gets blown away it will all be for naught. Pence would win in a landslide, and Trump and his family could glory in his victory, because he made it possible. He returned the Republican Party to its nationalist roots. 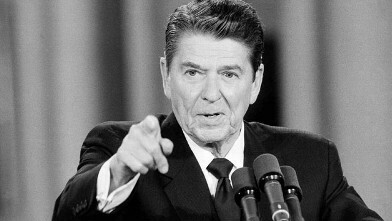 He showed more leadership in turning around the Party than anybody since Reagan. That’s an historic accomplishment. And the Trumps would benefit enormously as a family. This campaign has had to be extremely stressful to all concerned. His lovely wife made an embarrassing mistake in her national debut. Four years of this, under the eye of a microscope in the White House, would put a strain on any family. He’s 70 years old, and he’s going through a physical and emotional ordeal. It’s not going to get any easier. Does he really think that he’d be a better President than Mike Pence? Maybe, as far as making deals goes. But that’s a tiny part of the job, and the only one Trump is truly interested in. Why not let him try to negotiate trade deals? He could even get a few casinos out of it, as a kind of commission. Hell, Clinton would. In fact, speaking of deals, why shouldn’t he get all his money back? I’l bet every Never Trumper would donate to a fund to pay him all back. Hell, he’s earned more than simple reimbursement. I say, give him a casino.